Drive for Show, Putt for Dough. Long drives are nice, but in reality the majority of strokes take place under 100 yards. You can use a putting aid or try these putting drills to help stop three putting. I’ve studied thousands of golfers, at all skill levels, and found that nearly everybody makes almost every putt from inside two feet. Go a little farther to three feet, and golfers begin to miss (even Tour pros make only 85% to 95% of their three-footers). Step back to five feet and pros hole about 65%, while amateurs, if they’re lucky, are making about 50%. And at six feet, the best in the world, the PGA Tour professionals, sink about 50%, plus or minus 5%. From 10 feet, no one consistently holes better than 25%. And from over 15 feet? One in 10, best case, even for the pros. Over half of all strokes are from on the green. Since PGA Tour players are typically great ball strikers. The common conception is that Tour Events are essentially putting contests. The player with the best putting wins the tournament. If you want to lower your handicap, you need to focus on putting. Some beginners re-evaluate their equipment or focus on practice aids, but practice is key. Here are a few putting drills to tighten up your game. Nothing is worse than missing a “gimmie”. How many bogies have you walked away with after landing your approach shot 2 feet from the cup? The clock drill is intended to help get you comfortable with short putts by training you to read the green. Set up the clock drill by arranging 12 balls, each 2 feet from the cup. Place one ball at each hour of the clock. The drill is to go around the clock and read the break. See if you can get all the way around the clock without missing. Once you’re comfortable with everything at 2 feet, back the distance of each ball on the clock by a foot until comfortable with 6 foot putts. The ladder drill is intended to work on putting distance control. Use the ladder putting drill to get comfortable lagging putts to inside your comfort zone. On the practice green, place 4 tees in the ground in a line in increments of 10 feet. So you’ll have a tee at 10 feet, 20 feet, 30 feet and 40 feet away. In this drill, you want to work on controlling the distance of each putt by lagging to each of the tees. You will first hit a 10 footer, then 20 footer, etc. Once you hit all four, you putt the opposite direction back to where you were first hit from. Tiger’s gate drill is a great way of working on ensuring the putter head makes its way straight back and through, critical for sinking those short knee-knockers from 3 feet. Place two tees in the practice green 3 feet away from the hole – one very close to the toe of the putter and one close to the heel of the putter, wide enough so that the putter can pass through but not by much. Alternate between hitting a dozen putts with only one hand (your dominant hand – right for right handers, for example), then half a dozen with your usual, two handed grip. Set yourself a goal of say 50 or 100 putts in a row and start again if you miss one. This putting drill will improve the line of your putting stroke. If you come through at a bad angle the face of the putter will canon into the tees. As long as your alignment is correct and the putter is coming back and through straight, not much else can stop the ball from going into the cup. The PVC Pipe Challenge is designed to give immediate feedback on whether the face of the putter is coming through square. Grab a piece of PVC pipe marginally longer than the face of your putter. Place it on the ground and begin to ‘putt’ the pipe. If the pipe rolls forward perfectly you know that you have the putter coming through square. If the putter spins around like a top or veers out to the left or right, you know the putter has struck the pipe off the heel or the toe (depending on the behavior of the pipe). Make around 20 successful ‘pipe putts’ and you will see vast improvement on the moss. This drill is used to improve lower body stabilization during the putting stroke, leading to an improvement in putting consistency. At home, grab a piece of dowel (an alignment stick will also work) and a bungee cord and strap it to your lower body. Aiming for nowhere in particular (making putts is not important for the purpose of this drill), go through your putting stroke, focusing on keeping your lower body stationary at all times. In your peripheral vision you will see either end of the dowel or alignment stick and whether or not it moves back or forward. If it does move, you’ve got work to do! Pro tip: If you don’t have an alignment stick or a piece of dowel, get your backside flush against a wall and go through your stroke. The Poker Chip Drill is a a great way of improving your putting stroke depth and ensuring the ball is hitting the center of the face, not the bottom edge, causing the ball to lift off and bounce across the green instead of rolling towards the cup. This putting drill is a simple one; simply place a poker chip on the ground and begin to putt it around 20 or so times. If you swing over the chip it means, in practice, that the bottom edge of the putter will strike the center of the ball and not allow the ball to roll across the putting surface. Making putts is just as much about how you feel standing over the putt as it is your putting stroke. If you’re tentative, it’s likely that your stroke will break down when you need it the most. IF you’re confident, chances are that your stroke will reflect that. The Coin Drill is all about building confidence on the green. Find a flat spot on the practice green and place a coin a foot away from your ball. Focus on the coin and practice rolling the ball over the coin (don’t worry about a target – this drill is about confidence). Do this immediate-feedback drill as a warm-up to your putting practice and make 20 ‘roll-overs’ in a row. Your confidence will straight away skyrocket and you’ll notice the difference throughout the remainder of your session and during your round. The Path Drill is much like Tiger’s Gate drill in that it attempts to promote a straight back and through putting motion. Place two clubs parallel to each other on the practice green, not much further apart than the width of your putter head. Place the ball in the center of the two clubs and proceed to take your putt, focusing on keeping the putter face going straight back and straight through. If you can see your putter breaking the line of the clubs on the ground then you know you haven’t got the face coming through back and straight. Sometimes when we’re standing over a short putt we try and just dribble the ball into the hole, resulting in the ball losing optimal speed and falling away from the cup if there’s any type of break. Alternatively, we try and overcompensate for the possibility of a weak putt and stroke the ball too firmly, resulting in the dreaded horse-shoe and lip out. The Tee Backboard drill is designed to get you aiming for the back of the cup and producing a firm (but not too firm stroke). Place a tee in the back of the cup, directly in the middle line of the hole. Hit short putts with the goal of clipping the tee and letting the ball fall into the cup. This drill is all about replicating the pressure you will feel during your round on the practice green. Putt from distance from various locations around the practice green and treat every putt as a Par 2 hole. Whenever you miss a putt, take it back three feet (around the length of a standard putter) and try and finish the job. During this drill, you will NEVER have a putt within 3 feet, so the pressure of making those little knee -knockers that are just more than a gimme is always on. For added pressure, compete against your golf buddy to see who comes out on top. This drill is designed to improve your putting from just sinking the putt to sinking the putt with confidence. Place two tees on the entry to the hole, but place the tees are closer together than the width of the hole. This ensures that for you to make the putt, you will need to hit a good putt, not just merely a decent putt that gets the job done. The drill will improve your direction and aims to replicate the feeling of when you’re in the middle of a round and the hole feels so much smaller than it actually is. How many times have you been standing over a putt for birdie only to leave it short and be left scrambling for par? The cardinal sin of putting is leaving your birdie putts short, as you’re simply not giving it a chance of dropping in the cup. This drill aims to trick your senses into thinking you’re putting for a distance two or so feet past your intended target, meaning if you miss the putt, you’ll roll it past around that distance. Set up on the green and take your practice swing two or three feet directly behind the ball (far enough away so that the ball won’t be hit during your follow-through). Look at the target as you’re taking your practice swing and aim to take the swing as if you were hitting for the hole. Step up to your putt and replicate the tempo and length of your practice swing stroke. If you replicate it properly, the ball should have enough pace on it to roll past the hole by around two feet if it doesn’t drop in the hole. The three in a row drill is designed to improve your touch, feel and ultimately distance control around the greens. Line up three balls in a row on the practice green in front of you and without looking up try and putt all three balls the same distance. When you putt the third ball, look up and see how well you did. The closer the balls are to each other the better. This drill encourages a consistent, smooth and easy-to replicate putting stroke. The ease at which you are able to produce the same putting stroke is the key to distance control. When trying to sink short putts, a key problem that a lot of people have is moving around too much during the stroke. The Glove/Underarm drill attempts to minimize unnecessary movement during the putting stroke that is likely to result in a poorer than normal putting action. Place a glove under each armpit and attempt the putting stroke. Focus on keeping the upper arms anchored to the body and not moving around too much. If they separate from the body the glove will fall. Practice this drill enough and it will become second nature to you during a round, ensuring you keep good shape on the moss. This drill is particularly good for distance control and lag-putting, punishing putts that end up too far past the hole or leaving the putt short. Place three clubs around the hole in a horse shoe shape with the end of the two parralell clubs level with the line of the front of the cup. The aim of the game is to end with a score of zero after your 5 putts. Every time you leave a ball short of the hole, you lose 1 point. Every time you hit a club with the ball, you lose 1 point. Every time you leave the ball in the area within the clubs, you score 0 points. Every time you make a putt, you gain 1 point. Once you finish a round of 5 putts with a score of 0 or better take the balls back another three feet and try another round. Particularly for putts inside 10 feet, the biggest problem with missing putts is a lack of putter face control – either it opens or closes at the point of impact. The triangle putting drill aims to alleviate the possibility of the putter face opening or closing at the point of impact. Grab yourself the True Pendulum Motion unit or even two alignment sticks and tape the ends of them towards the bottom of the putter shaft. The top of the alignment sticks should be free to make a V shape which sit in your armpits when you’re holding the putter. Carry on through the putting motion as you normally would. The positioning and anchoring of the alignment sticks will make the manipulating of the putter face almost impossible, ensuring that the putter face will always come through square. Practice this a few times during the course of your practice session and you will train you body to get into good habits when making those relatively short putts. The Follow Through Drill is an exercise that can be done on the practice green to tighten up the line of your follow through, ensuring that it goes through straight and towards the target. Simply set up a putt on a flat part of the green two feet away from the hole. Place the putter behind the ball and only practice the follow through, i.e. do not bring the putter back. Let the ball roll along the club face and into the hole. If you are following through straight, the face of the putter should still be facing the hole when the stroke is complete. Note that this drill can only be done during practice, as the rules of golf only allow the ball to hit the putter once during a stroke. Balance during the putting stroke is a very underrated aspect of making a putt. This drill will give you immediate feedback as to whether or not you’re balanced during your putt. Simply grab a yard stick or something similar like the and place it on the ground. Stand on top of it and ensure the stick pass through the middle of your feet. Set up as if you were putting and go through a few different motions. The weight should be in the middle of your feet (the arches) as you are making the putting stroke to ensure you are balanced during your putt. An off-balance putting stroke can result in alignment and direction of the putter head being less than ideal, meaning you make less putts when you’re off balance. The Bowling Alley Canon is a great drill for practicing your alignment and accuracy, and as a bonus – you can do this one at home, in the office or out on the practice green. 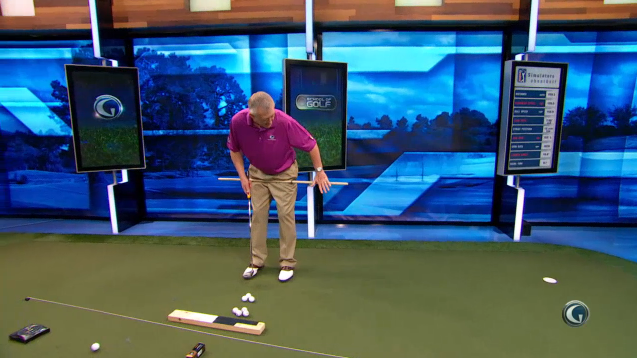 Grab two alignment sticks or shafts and place them on the ground like a bowling alley, not too far apart. Drop a ball towards the start of the alley and then drop another a few feet back. The goal of the drill is to put your ball towards the alley ball, directing it through the alley and towards the end without hitting the sides. Once you putt the ball, bring it back to the original position and try and hit it again to move it forward. The ideal scenario is that you hit solid, consistent putts that strike the center of the ball and move the ball through the alley. Debbie Doniger – A top 50 Golf Digest Instructors. Debbie’s favorite putting drills are focused on center contact. An example she shared was to use the blade of your 7 iron to drill connecting with the ball in the center. Tony Ruggiero – Lead Instructor, Dewsweepers Golf School. Tony’s favorite putting drill is to use Robert Jackins’s Putt Commander and do your full putting routine on practice putts of all lengths instead of just whacking putts. Simon Fagan – Full time Golf Instructor for the last 14 years, including for Hank Haney. Simon’s favorite putting drill are pull backs. Putt 18 holes from 20+ feet. If the putt is not inside the length of the grip of your putter, pull the ball back one club length. Keep your score and see how much you can improve. Mark Immelman – Head Golf Coach at Columbus State and host of the On the Mark podcast. To practice good contact Mark’s favorite drill is to practice striking a coin instead of a ball. This is to find the correct low point since contact impacts both the speed and line of a putt. Doug Alexander – Master Golf Instructor for Hank Haney. Doug’s favorite putting drill is to put tees 40 feet apart on a practice green and lag 10 balls back and forth with the goal of keeping the balls within a putter length of the tees.